Len Andrews Enterprises Inc. specializes in computer networking services for industrial, commercial and residential environments. 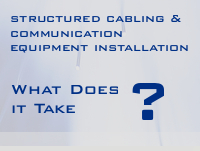 We offer a complete range of high quality design, installation and maintenance services for fibre optic, single or multi mode, twisted pair and coaxial cable systems. Partnering with technology leaders, Len Andrews Enterprises Inc. can provide a total solution for all your telecommunications needs. We also subcontract to the building trades or directly with the end user. Our mission is to enhance our client’s communications capabilities with the most innovative and technologically advanced products and services available today. We aim to create communication networks that exceed the expectations of our clients and span the gap towards their future needs. We do everything possible to assure complete customer satisfaction. Copyright © 2011. Len Andrews Enterprises. All rights reserved.